For the affiliated medical center in Sacramento, see UC Davis Medical Center. The University of California, Davis (also referred to as UC Davis), is a public research university and land-grant university adjacent to Davis, California. It is part of the University of California (UC) system and has the third-largest enrollment in the UC System after UCLA and UC Berkeley. The institution was founded as a branch in 1909 and became its own separate entity in 1959. It has been labeled one of the "Public Ivies", a publicly funded university considered to provide a quality of education comparable to those of the Ivy League. The Carnegie Foundation classifies UC Davis as a comprehensive doctoral research university with a medical program, and very high research activity. The UC Davis faculty includes 23 members of the National Academy of Sciences, 30 members of the American Academy of Arts and Sciences, 17 members of the American Law Institute, 14 members of the Institute of Medicine, and 14 members of the National Academy of Engineering. Among other honors, university faculty, alumni, and researchers have won the Nobel Peace Prize, Presidential Medal of Freedom, Pulitzer Prize, MacArthur Fellowship, National Medal of Science, Blue Planet Prize, and Presidential Early Career Award for Scientists and Engineers. Founded as primarily an agricultural campus, the university has expanded over the past century to include graduate and professional programs in medicine (which includes the UC Davis Medical Center), law, veterinary medicine, education, nursing, and business management, in addition to 90 research programs offered by UC Davis Graduate Studies. The UC Davis School of Veterinary Medicine is the largest in the United States and has been ranked first in the world for four consecutive years, 2015, 2016, 2017, and 2018. The UC Davis Aggies athletic teams compete in the NCAA Division I level, primarily in the Big West Conference as well as the Big Sky Conference (football only) and the Mountain Pacific Sports Federation. In its first year of full Division I status, 11 UC Davis teams qualified for NCAA post-season competition. UC Davis was ranked as the 29th best national university, and as the 42nd best world university according to the 2018-2019 CWUR rankings. Additionally, UC Davis was named the 5th best public university in the nation according to the 2019 Times/WSJ rankings. After two failed bills, a law authorizing the creation of a University Farm was passed on March 18, 1905. Yolo County, home to some of California's prime farmland, was chosen as the site. A committee appointed by the Regents purchased land near Davisville (now Davis) in 1906. The Regents officially took control of the property in September 1906 and constructed four buildings in 1907. Short courses were first offered in 1908 and a three-year non-degree program set up in 1909. In 1911, the first class graduated from the University Farm. The Farm accepted its first female students in 1914 from Berkeley. The three-year non-degree program continued until 1923. Renamed in 1922 as the Northern Branch of the College of Agriculture, the institution continued growing at a breakneck pace: in 1916 the Farm's 314 students occupied the original 778 acres (315 ha) campus. By 1951 it had expanded to a size of 3,000 acres (1,200 ha). In 1959, the campus was declared by the Regents of the University of California as the seventh general campus in the University of California system. Davis' Graduate Division was established in 1961 followed by the College of Engineering in 1962. The law school opened for classes in fall 1966, and the School of Medicine began instruction in fall 1968. In a period of increasing activism, a Native American studies program was started in 1969, one of the first at a major university; it was later developed as a full department within the university. During a protest against tuition hikes on November 18, 2011, a campus police officer, Lieutenant John Pike, used pepper spray on a group of seated demonstrators when they refused to disperse, and another officer also pepper sprayed demonstrators at Pike's direction. The incident drew international attention and led to further demonstrations, a formal investigation, and Pike's departure in July 2012. Documents released in 2016 through a public records request showed that the university had spent at least $175,000 to attempt to "scrub the Internet of negative postings" about the incident, in efforts that started in 2013. California newspaper The Sacramento Bee obtained a document outlining the public relations strategy, which stated: "Nevins and Associates is prepared to create and execute an online branding campaign designed to clean up the negative attention the University of California, Davis, and Chancellor Katehi have received related to the events that transpired in November 2011". The strategy included an "aggressive and comprehensive online campaign to eliminate the negative search results" intended to achieve the "eradication of references to the pepper spray incident in search results on Google for the university and the Chancellor". The university's strategic communications office, which has worked on the management of the reputation of the university and its chancellor, has had its budget substantially increased since the current chancellor took office – rising from $2.93 million in 2009 to $5.47 million in 2015. In August 2016 Katehi resigned as chancellor, and under the terms of her contract, will continue to be a full-time faculty member at UCD. Although named after the City of Davis, the campus is technically located adjacent to the City of Davis in an unincorporated part of Yolo and Solano counties. The main campus is located 15 miles (24.1 km) west of Sacramento in the Sacramento Valley, part of California's Central Valley, and is adjacent to Interstate 80. 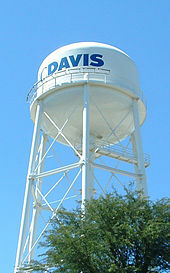 The city of Davis is a college town, with the ratio of students to long term residents estimated at 1:4. Also contributing to the college-town environment is the close proximity of downtown Davis to the campus' main quad—a matter of a few blocks, and 5- to 10-minute walk or bike ride. Davis' 15 minute distance from Sacramento provides it with both the isolation critical to fostering a college-town environment while also providing a lively and large metropolitan area nearby. Although the campus itself is vast, the entire community of Davis is relatively small and is easily traversable on bike utilizing Davis' extensive bicycle trails. Towards the northeast end of campus is the Quad, a large rectangular field, which was the historic geographic center of campus. Earlier in the campus' history, the few campus buildings surrounded the four sides of the Quad. Today, though the campus has grown significantly and the geographic center of campus has shifted, the Quad remains the center of campus life, anchored to the north by the Memorial Union (student union), to the south by Shields Library and to the West and Southeast by Wellman and Olson Halls respectively. 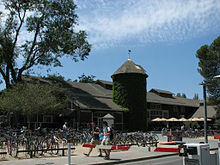 The Memorial Union Complex houses Freeborn Hall and the Memorial Union, which houses various establishments such as the UC Davis Bookstore. The northeast side of campus holds more of the core buildings that were built earlier in UC Davis's history, such as Wellman Hall, Shields Library, Mrak Hall, and Hutchison Hall. Also notable in this northeastern corner is the labyrinthine Social Sciences and Humanities building designed by Antoine Predock, known to students as the "Death Star" for its angular, metallic design. The majority of Equestrian Center, and Animal Sciences buildings are located near the Arboretum Waterway, away from the core campus; the West Entry Parking Complex, the Silo Union, and the newly constructed Science Lecture Hall and the Science Laboratory Building are located nearer to the Tercero residence halls and the core of campus. 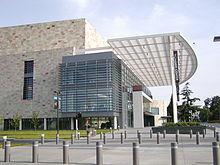 The Mondavi Center, home of the University Symphony Orchestra and other cultural events, is also located near the Tercero complex. For most of UC Davis' history, West Campus has served primarily as agricultural research land. Recently, portions were developed through a $300 million public-private partnership to form the largest zero net energy community in the United States, known as UC Davis West Village. West Village will provide housing for 3,000 students, faculty and staff and will help the university recruit and retain top faculty. The project will include 662 apartments, 343 single-family homes, 42,500 square feet of commercial space, a recreation center and study facilities. West Village will also host the first community college on a UC campus. The classes held in this area mainly involve plant sciences, but also include entomology courses as well. Students in the plant sciences maintain gardens as part of the PLS 5 lab while Entomology 156L and 158 students embark on field trips to sample fish for parasites at Putah Creek and conduct projects in forensic entomology at the UC Davis ecosystem, respectively. West Campus is also home to the University Airport, Foundation Plant Services, the California National Primate Research Center, and the Contained Research Facility, a bio-safety level 3 facility. To the south side of the campus core is the 100-acre UC Davis Arboretum, which includes 3.5 miles of paved paths, 4,000 tree specimens, Putah Creek and Lake Spafford. On March 10, 2017, a multi-year waterway enhancement project began. There are seven public art statues found around campus, collectively called The Egghead Series, sculpted by the late Robert Arneson, who also taught at Davis from 1962–1991. Bookhead is located at the Shields Library plaza, Yin & Yang is located at the Fine Arts Complex, See No Evil/Hear No Evil is at the east lawn of King Hall (the main building for UC Davis' School of Law), Eye on Mrak (FatalLaff) is outside Mrak Hall (housing the registrar office and other administrative offices), and Stargazer is located between North Hall and Young Hall. The Yin & Yang egg heads have been recast and duplicated for installation near the Port of San Francisco Ferry Building in San Francisco. UC Davis Student Housing operates 23 residence halls totaling 29 buildings which are organized into three areas: Segundo, Tercero, and Cuarto. The northwest end of campus holds the majority of the Segundo undergraduate housing complex, and various alternative housing sites, such as Orchard Park, Russell Park, The Colleges at LaRue Apartments, and Primero Grove. The Activities and Recreation Center, or the ARC, is also located near the Segundo complex. Adjacent to the northwest corner of campus is the Cuarto undergraduate housing complex, which has one dining commons. The Tercero undergraduate housing complex is located near the geographic center of the UC Davis campus, to the north of the Arboretum Waterway. This extends longitudinally through almost the entirety of the south end of campus. Solano Park, UC Davis' family housing complex, is located adjacent to the Arboretum Waterway, at the Eastern end of campus. The Davis Arboretum is a public botanic garden with over 4,000 kinds of trees and plants, including many California native plants, which has been developed over 100 acres (40 ha) along The Waterway. The Cuarto undergraduate (freshmen and transfer students) housing complex is located one block off-campus, across Russell Boulevard. Unlike the other undergraduate housing complexes, Cuarto is located within city limits; its residents may vote in city elections. The entire University of California system is governed by the regents, a 26-member board, as established under Article IX, Section 9 of the California Constitution. The board appoints the university's principal officers including the system-wide president and UC Davis Chancellor. The UC Davis Chancellor has overall responsibility for the leadership, management, and administration of the campus and reports to the President of the University of California system, a position currently held by former Secretary of Homeland Security and Arizona Governor Janet Napolitano. The Offices of the Chancellor and Provost is headed by the executive vice-chancellor and provost (EVCP). In their capacity as executive vice-chancellor, the EVCP shares with the chancellor in the overall leadership and management of campus administration and operations, whereas as provost, the EVCP, is UC Davis' chief academic officer. The senior staff provides executive support to the Offices of the Chancellor and Provost. The Council of Deans and Vice-Chancellor consists of the heads of the university's major academic and administrative units. Students are most likely to interact with or be directly affected by the Office of Student Affairs, which is run by the vice chancellor of student affairs, currently Fred Wood, and by a variety of associate and assistant vice-chancellors. This office oversees many campus units including: Admissions, Athletics, Campus Recreation, Campus Unions, Counseling and Psychological Services, Financial Aid, Student Housing and others. Women comprised 59% of the undergraduates in fall 2016; men 41%. In 2010, the United States Census Bureau made UC Davis its own separate census-designated place for statistical purposes. The campus location is out of the bounds of the Davis city limit. In 2014, Chancellor Katehi stated that UC Davis aims to become a Hispanic-Serving Institution by the 2018–2019 school year, with at least 25% of the undergraduate student body consisting of Latinos. The university has 104 undergraduate majors and 96 graduate programs. It has a Department of Viticulture and Enology (concerning the scientific study of grape-growing and winemaking) that has been and continues to be responsible for significant advancements in winemaking utilized by many Californian wineries. The campus claims to be noted for its top-rated Agricultural and Resource Economics programs  and the large Department of Animal Science through which students can study at the university's own on-campus dairy, meat-processing plant, equestrian facility, and experimental farm. Students of Environmental Horticulture and other botanical sciences have many acres of campus farmland and the University of California, Davis, Arboretum at their disposal. The Department of Applied Science was founded and formerly chaired by physicist Edward Teller. The arts are also studied extensively on campus with subjects such as studio art, design, music, theater and dance. The Design Department at UC Davis is the only comprehensive academic design unit of the University of California system. There is also the Mondavi Center for the Performing Arts which features artists from all over the globe. UC Davis is considered to be a "Public Ivy." In its 2017 edition, U.S. News & World Report ranked UC Davis as tied for the 10th-best public university in the United States, tied for 44th nationally and 42nd globally. Washington Monthly ranked UC Davis 10th in its 2016 National University Ranking. In its 2017 rankings, Money magazine ranked UC Davis 9th in the country out of the nearly 2400 schools it evaluated for its 2017–2018 Best Colleges ranking. Forbes ranked UC Davis as 102th overall in the nation, 52nd among research universities, and 21st among public colleges. For 2016 Kiplinger ranked Davis 39th out of the top 100 best-value public colleges and universities in the U.S. According to the 2015 Top 50 Colleges and Universities in America published by The Best Colleges, UC Davis is ranked 27th nationally. The Daily Beast ranked UC Davis 68th in the country out of the nearly 2000 schools it evaluated for its 2014 Best Colleges ranking. The university has several distinguished graduate programs ranked in the top 10 in their fields by the United States National Research Council; most notable are its programs in agricultural economics, entomology, evolutionary biology, plant biology, and ecology. Additionally, the NRC placed more than a third of UC Davis graduate programs in the top 25% of their respective fields. In 2016, U.S. News & World Report rated UC Davis 2nd globally in Agricultural Sciences, 1st in Plant and Animal Science, 4th in Environment/Ecology, and 1st nationally in Veterinary Medicine, 3rd in Ecology and Evolutionary Biology, 7th (tie) in Biological and Agricultural Engineering, 9th in U.S. Colonial History, 15th in Comparative Politics, 19th in Biological Sciences, 20th in Earth Sciences and 21st in Psychology. The Economics department of UC Davis was also ranked 6th among public universities and 20th nationally according to the RePec (Research Papers in Economics) Rankings in 2011. In 2013, The Economist placed UC Davis Graduate School of Management in the top 8% accredited MBA programs in the United States (ranked 37th nationally and 65th globally). The Academic Ranking of World Universities placed UC Davis 39th nationally and 75th globally for 2016. In its 2016–17 rankings, Times Higher Education World University Rankings ranked it tied for 51st in the world. The QS World University Rankings ranked it tied for 85th globally in 2016, with Veterinary Science ranked No. 1 in the world. In 2016, Sierra Magazine ranked UC Davis 8th in its "Coolest Schools" in America list for campus sustainability and climate change efforts. The Newsweek College Rankings of 2011 had UC Davis in 10th place among the "Happiest Schools in America" and 11th among the "Greenest Schools" in the United States. UC Davis was awarded an A- from the 2011 College Sustainability Report Card, which grades schools on their environmental sustainability across nine categories. In 2012, – 2013, UC Davis was also ranked 1st among research universities (tied with UC Berkeley and Penn State) as top producers of Fulbright Scholars. UC Davis was ranked as the #6 college in the United States by the Social Mobility Index college rankings. Admission to UC Davis is rated as "more selective" by U.S. News & World Report. For Fall 2016, UC Davis received 67,472 freshmen applications; 28,617 were admitted (42.4%) and 5,760 enrolled. The average high school grade point average (GPA) of the enrolled freshmen was 3.99, while the middle 50% range of SAT scores were 510–630 for critical reading, 540–700 for math, and 520–650 for writing. The middle 50% range of the ACT Composite score was 24–30. UC Davis' libraries include the Peter J. Shields Library, the Physical Sciences & Engineering Library, the Carlson Health Sciences Library, and the Medical Center Library in Sacramento, contain more than 3.5 million volumes and offers a number of special collections and services. 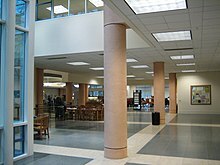 The Peter J. Shields Library has three different architectural styles due to various construction and extensions being added; it is the main library where students study on-campus, with a 24-hour reading room, open computer labs, and unique furniture. The university is host to an Army Reserve Officer Training Corps (ROTC) program, the Forged Gold Battalion, with more than 50 cadets. With more than sixty years in existence, it currently commissions roughly 10 graduating seniors as second lieutenants every year. The University of California Davis Graduate Programs of Study are post-graduate programs offered by the University of California Davis. The division consists of over 90 programs, offering masters and doctoral degrees and post-doctoral courses. The programs educate over 4,000 students from around the world. The University of California, Davis graduate division has a long history. Graduate education has been a major feature of the academic focus for over 80 years. This academic tradition began in the fall of 1925, when 12 students received graduate degrees from the College of Agriculture through a partnership with the graduate division of the University California at Berkeley. Over the years, the programs continued to grow, interact and collaborate. The first graduate degrees were awarded from the UC Davis campus in the fall of 1949. In 1961, autonomous Graduate Divisions and Graduate Councils were established on all University of California campuses to provide focused oversight of their graduate programs. A key feature of graduate education at UC Davis is the graduate group. The core elements of a graduate group include an emphasis on "shared research interests among faculty and students; flexibility to grow and quickly change to reflect emerging areas of interdisciplinary knowledge and technology; and an acceptance that many research questions transcend traditional academic departmental boundaries." UC Davis offers more graduate groups than any other campus in the UC system. U.S. News & World Report, "America's Best Graduate Schools 2015" ranked several UC Davis graduate programs among the top in the nation. Following a comprehensive survey of US doctorate programs, the National Research Council released results in 2010 ranking UC Davis graduate programs among the nation's best. Among the top five percent were graduate programs in Spanish, entomology, agricultural and resource economics, plant biology, ecology, and nutritional biology. Approximately one-third of UC Davis graduate programs ranked in the top 25 percent in their respective fields. In 2016, U.S. News & World Report named UC Davis School of Medicine as the 6th most competitive medical school in the United States with an acceptance rate of 2.8%. UC Davis is one of 62 members in the Association of American Universities, an organization of leading research universities devoted to maintaining a strong system of academic research and education. It consists of sixty universities in the United States (both public and private) and two universities in Canada. According to the National Science Foundation, UC Davis spent $725.7 million on research and development in fiscal year 2013, ranking it 25th in the nation. Its faculty includes 23 members of the National Academy of Sciences, 14 members of the National Academy of Engineering, 30 members of the American Academy of Arts and Sciences, 17 members of the American Law Institute, 5 members of the Royal Society, 3 Pulitzer Prize winners, 1 Guggenheim Fellow, and 3 MacArthur Fellows. Energy Efficiency Center (the very first university run energy efficiency center in the Nation). The Crocker Nuclear Laboratory on campus has had a nuclear accelerator since 1966. The laboratory is used by scientists and engineers from private industry, universities and government to research topics including nuclear physics, applied solid state physics, radiation effects, air quality, planetary geology and cosmogenics. UC Davis is the only UC campus, besides Berkeley, that has a nuclear laboratory. Agilent Technologies will also work with the university in establishing a Davis Millimeter Wave Research Center to conduct research into millimeter wave and THz systems. The undergraduate student government of UC Davis is the Associated Students of UC Davis (ASUCD), and has an annual operating budget of 11.1 million dollars, making it one of the largest-funded student governments in the United States. ASUCD includes an Executive, Legislative, and Judicial branch. Other than representing the student body on campus, the task of ASUCD is to lobby student interests to local and state government. Also under the purview of ASUCD are the student-run Coffee House is an ASUCD unit and Unitrans, the Davis public bus system. ASUCD employs thousands of students annually across its many units. UC Davis California Aggie Marching Band-uh! Picnic Day, UC Davis's annual Open House, is the largest student-run event in the United States. It attracts thousands of visitors each year with its many attractions. These include a parade, a magic show performed by the chemistry department, the Doxie Derby (dachshund races), film screenings, and a Battle of the Bands between the Band-Uh! and other college bands including the Cal Band, the Stanford Band, and the Humboldt State University Marching Lumberjacks. Another highlight of UC Davis is its student-run freeform radio station, KDVS. The station began operations on February 1, 1964, from the laundry room of the all-male dormitory Beckett Hall. The station soon gained a reputation by airing interviews with Angela Davis and a live call-in show with then California Governor Ronald Reagan in 1969. The station can now be heard on 90.3 FM and online at its website. UC Davis has over 500 registered student organizations, ranging from political clubs to professional societies to language clubs. The academic Graduate Students and management students are represented by the Graduate Student Association (GSA). The Law Students are represented by Law Students Association. Students are also encouraged to wear Aggie Blue on game days to show their Aggie Pride. If spotted wearing Aggie Blue by the Aggie Pack, students may have UC Davis paraphernalia thrown at them as a reward. Students also participate in intramural sports such as basketball, ultimate frisbee, soccer and many more. The ARC contains a basketball gym, work out room, rock climbing wall, and other studio rooms for group exercise. Unitrans, the student run (and driven) bus system. The Coffee House, also known as the CoHo, is a student run restaurant serving 7000 customers daily. The Bike Barn, a bicycle shop that sells and rents bicycles and cycling equipment, also operating a repair shop. The Entertainment Council, responsible for bringing famous musicians to campus and organizing student events. US Post Office, a completely student-run official United States Postal Service Contract Station. Many students use bicycles to get around the 7000-acre campus. Bicyclists are ubiquitous around campus as well as the city, and thus a lot of bike-only infrastructure exists, such as bike circles, large bike lanes, and traffic signals exclusively for bikes and the UC Davis cycling team has won several national championship titles. The campus police department also has some of its officers patrol on bicycles and take bicycling under the influence ("BUI") and bicycling without a headlight at night very seriously. 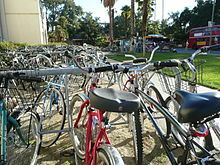 All bikes on the UC Davis campus must be registered with a California Bicycle license or they risk being sold at the on campus bike auction. 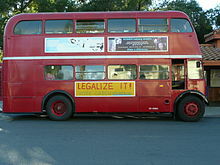 UC Davis is also well known for its bus service, Unitrans, and its trademark London double decker buses. It has been in operation since 1968 and is believed to be the only general purpose (non-sightseeing) transit system in the U.S. to operate vintage double deck buses in daily service. The system is operated and managed entirely by students and offers fixed-route transportation throughout the city. There is also an inter-campus bus service that ferries back and forth between UC Davis and UC Berkeley twice daily, from Monday to Friday. Davis is also one of the busiest stations of the Capitol Corridor intercity railroad service operated by Amtrak between the Bay Area and Sacramento. The central campus is bounded by freeways on two sides (Highway 113 and Interstate 80). All other UC campuses are either somewhat distant from the closest freeway or are directly adjacent to only one freeway. Two freeway exits are entirely within UCD's boundaries. One, off Highway 113, is signed "UC Davis / Hutchison Drive" and the other, off Interstate 80, is signed exclusively as "UC Davis." Easy freeway access, coupled with increasing housing costs in the city of Davis, have led to increased numbers of students commuting via automobile. Some students choose to live in the neighboring communities of Sacramento, Dixon or Woodland, and use their own cars or the county-wide Yolobus to get to UC Davis. UC Davis also publishes a weekly student newspaper, The California Aggie. The Aggie was first published in 1915 as the Weekly Agricola after its approval by the Associated Student Executive Committee. At this point, UC Davis was considered the University Farm, an extension of UC Berkeley. Initially, the Weekly Agricola was focused on both student news and farming-related topics. Novelist Jack London was one of the first readers of the Weekly Agricola. In 1922, it was renamed to match the school's athletic name. Between March 2014 and October 2016, the Aggie not in print but was still accessible online. The Aggie is in print and available on campus again as of October 2016[update]. Social fraternities and sororities have been a part of the University of California at Davis since 1913. Approximately 8% of the university's undergraduate students are involved in the school's fraternities and sororities. One sorority, Sigma Alpha Epsilon Pi, was featured during the first season of the MTV reality show Sorority Life. There are currently 21 social fraternities that are a part of the Interfraternity Council (IFC) in Davis. The IFC representatives attend weekly meetings to guarantee that all UC Davis rules and regulations are followed. The meetings are also used to inform the fraternities about all upcoming activities throughout the week. The 21 fraternities are: Alpha Epsilon Pi, Alpha Gamma Omega, Alpha Gamma Rho, Alpha Sigma Phi, Chi Phi, Delta Chi, Delta Lambda Phi, Delta Sigma Phi, Kappa Sigma, Phi Delta Theta, Phi Kappa Psi, Pi Kappa Alpha, Pi Kappa Phi, Sigma Alpha Mu, Sigma Chi, Sigma Nu, Sigma Phi Epsilon, Tau Kappa Epsilon, Theta Chi, Theta Xi, and Zeta Psi. The Davis Collegiate Panhellenic Council (DCPA) is similar to the Interfraternity Council, but is the governing council for several sororities at UC Davis. They are responsible for organizing recruitment, and overseeing that all regulations are upheld. There are currently 11 sororities that are a part of the Panhellenic Council. The 11 sororities are: alpha Kappa Delta Phi, Alpha Chi Omega, Alpha Delta Pi, Alpha Phi, Chi Omega, Delta Delta Delta, Delta Gamma, Kappa Alpha Theta, Kappa Kappa Gamma, Pi Beta Phi, Sigma Alpha Epsilon Pi. The Phi Chapter of Alpha Gamma Rho was locally established May 1 of 1923 at UC Davis making it the first continuously running national fraternity on campus. They started as the Kappa Tau Fraternity, which was the first Agricultural Fraternity on campus. Many campus buildings are named after alumni of Alpha Gamma Rho such as Emil Mrak (Mrak Hall, Registrar's office), Orville Thompson (Thompson Hall, Segundo student housing), and Dean De Carli (the De Carli room, 2nd floor MU), Mel Olson Scoreboard (Aggie Stadium), and many more. The AGR Hall is an event space located inside the Buehler Alumni / Visitor's Center and is commonly rented out as a conference room or banquet hall. There are both national and local fraternities and sororities at UCD with diverse backgrounds and histories. The UC Davis Aggies (also referred to as Cal Aggies or Ags) compete in NCAA Division I sports in the Big West Conference. For football, the Aggies compete in Division I FCS (formerly known as Division I-AA), and are members of the Big Sky Conference, granting UC Davis the distinction of being one of only three UC campuses to field a football team (Cal and UCLA being the other two). The Aggies are also members of the Mountain Pacific Sports Federation in gymnastics and lacrosse, the America East Conference in field hockey, the Western Intercollegiate Rowing Association and Davis Men's Crew Club for rowing. The UC Davis Men's Crew Club is one of the successful clubs both on campus and in the West. In 2008 the JV boat won first in nationals at the ACRA Championships in Tennessee and in 2009 the Varsity boat got second place in nationals at the ACRA Championships. They consistently compete against teams such as Stanford, the University of Washington and UC Berkeley. The Aggies finished first in NCAA Division II six times in 2003 and won the NACDA Directors' Cup 4 years in a row from 1999 to 2003. In 1998, the UC Davis men's basketball team won the NCAA Division II national championship despite being one of the few non-scholarship institutions in Division II at that time. They have also won NCAA Division II championships in Softball (2003), Men's Tennis (1992), and Women's Tennis (1990, 1993). These and other achievements motivated a decision (following a year of heavy discussion by campus administrators, faculty, staff, students, alumni and the local community) in 2003 for the athletics program to re-classify to Division I. The highlight of UC Davis's 4-year transition to Division I occurred on September 17, 2005, when the Aggies defeated the heavily favored Stanford Cardinal at Stanford Stadium by a score of 20–17 on a touchdown pass with 8 seconds left in the game. The Aggies also pulled off an upset against Stanford in basketball just months later, beating the Cardinal 64–58 with a late rally at home on December 4, 2005. The win in these two major sports and the addition of the Aggies beating the Cardinal in soccer earlier in 2005 as well as a win in wrestling and two wins in baseball pulled the Aggies' win loss record with Stanford to 5–1 for men's sports the 05-06 year. The Aggie football team plays Sacramento State in the annual Causeway Classic for the Causeway Carriage. The team also plays Cal Poly San Luis Obispo in the annual Battle for the Golden Horseshoe. UC Davis students gather at sporting events to rally as the Aggie Pack, the largest student-run school spirit organization in the United States. The Aggie Pack cheers on the sports team along with the Spirit Squad to the music of the Cal Aggie Marching Band-uh! and its alumni band. Aggie Stadium is the home of the UC Davis football and lacrosse teams. UC Davis had a wrestling program, which competed in the Pac-10 at the Division I level. In 2007, UC Davis wrestler Derek Moore gained All-American status, as well as winning the NCAA Division I Championships for his weight class. Moore also received the "Most Outstanding Wrestler" award of the NCAA tournament. In doing so, Derek Moore became the first UC Davis student-athlete to become a NCAA champion at the Division I level. That same year, UC Davis finished within the top 25 for Division I collegiate wrestling programs in the country. Because of budget pressure, wrestling was cut from the athletic department in April 2010. Other cuts included men's swimming, men's indoor track, and women's rowing. The athletics department had to cut $1.79 million out of the budget. 14 women's teams and 9 men's teams were funded for the 2010–2011 school year. The official school colors are blue and gold. The blue is due to the UC's early connection to Yale and as a result is often referred to as "Yale Blue" (e.g., see). and  UCD's official blue, usually called "Aggie Blue", is Pantone 295, which is distinct from Yale Blue (approximately Pantone 289). The official school mascot is the mustang. Students at UC Davis are referred to as Aggies in honor of the school's origins in agricultural studies. Unlike most colleges, there is a distinction between the name for students and the mascot. Some students supported changing the school mascot from the mustang to a cow, but alumni opposed this action. Many people call the mustang mascot of UC Davis an Aggie, but it is named Gunrock. The name dates to 1921 when the US Army brought a thoroughbred horse named Gunrock to UC Davis to supply high-quality breeding stock for the US Cavalry remount program. The mustang mascot was selected to honor that cavalry horse. UC Davis claims to have implemented many environmentally sustainable features on campus. In the Fall of 2010, UCD opened a renovated Dining Commons in the Cuarto living area. The dining hall uses local produce and promotes sustainability. The university operates twenty LEED-certified buildings across three of the five overarching LEED categories. Examples include the Robert Mondavi Institute for Wine and Food Science, the first brewery, winery or food-processing facility in the world to achieve Platinum-level certification and the Tahoe Center for Environmental Sciences at Lake Tahoe, one of only five laboratories in the world to achieve Platinum-level certification. 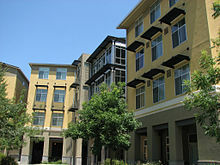 It developed UC Davis West Village as a "zero net energy" community. The university received two Best Practice Awards at the 2009 annual Sustainability Conference, held by the University of California, California State University and the California Community Colleges, for the campus's lighting retrofit project and sustainable design in new construction. UC Davis harvests olives from the old trees on campus to produce olive oil and table olives for use in campus dining rooms. It has designed landscaping with drought-tolerant trees and other plants. The campus operates its own landfill, where it converts landfill (methane) gas to energy. For its efforts in campus sustainability, UC Davis earned an A- on the 2011 College Sustainability Report Card, one of 27 universities to achieve this, the highest grade awarded. In February 2014, UC Davis and Diamond Developers formed a joint venture to create a sustainable city in Dubai, United Arab Emirates. The draft design for the sustainable city in Dubai called for an “eco-village” on 120 acres with enough housing for 1,200 people. The plan called for K-12 education, apartments, single family homes, and retail shops. In May 2015, UC Davis and Diamond expanded the joint venture to include sustainability professional training program. UC Davis became the first university to implement requiring payment of a fee for all single-use bags distributed on campus; it is working to become the first university campus to ban plastic bags entirely. UC Davis is also home to the Agricultural Sustainability Institute (ASI), which is part of the College of Agricultural and Environmental Sciences (CAES). ASI provides leadership for research, teaching, outreach, and extension efforts in agricultural and food systems sustainability at the Davis campus and throughout the UC system. UC Davis hosted the Governors' Global Climate Summit 3 (GGCS3), an international climate forum for the top leaders of local, regional, national and international entities, as well as those from academia, business and nonprofits. The summit worked to broaden national partnerships in continuing to grow a clean, green economy. The summit included more than 1,500 attendees from more than 80 countries. For a more comprehensive list, see List of University of California, Davis alumni. UC Davis currently has over 260,000 living alumni. Notable alumni of UC Davis include two astronauts; US Treasurer Anna Escobedo Cabral; Chevron CEO John S. Watson; entrepreneur Jason Lucash; and actor Matthew Moy. Notable faculty include two-time Pulitzer Prize-winning historian Alan Taylor. ^ 2016 Endowment, $1.1 billion. "Best Colleges, U.S. News and World Report". ^ "UC Davis 2017-18 annual budget" (PDF). UC Davis. April 16, 2018. Archived from the original (PDF) on 2018-04-28. Retrieved 2018-04-27. ^ "Why Gary May is a promising pick to lead UC Davis". Sacramento Bee. Retrieved February 25, 2017. ^ a b c "UC Davis Student Profile" (PDF). University of California, Davis. Retrieved 2017-07-27. ^ "UC Davis Total On- and Off-Campus Headcount Population: Annual Averages" (PDF). UC Davis Institutional Analysis. November 16, 2015. Archived from the original (PDF) on December 19, 2014. ^ a b "University of California Annual Financial Report 12/13 – Campus Facts in Brief" (PDF). University of California. 2012. ^ "Colors – Marketing Toolbox". ucdavis.edu. ^ "Annual Financial Report, 12/13; p.10" (PDF). Executive Vice President, CFO of the Regents of the University of California. ^ a b Greene, Howard R.; Greene, Matthew W. (2001). The public ivies: America's flagship public universities (1st ed.). New York: Cliff Street Books. ISBN 978-0060934590. ^ "University of California, Davis". Classifications. The Carnegie Foundation for the Advancement of Teaching. 2010. Retrieved 2011-08-27. ^ a b c "National and International Honors". University of California, Davis. 2015. Archived from the original on 2015-12-22. Retrieved 2015-12-21. ^ "A Piece of the Nobel for UC Davis". University of California, Davis. 2007. ^ "US News Graduate School Rankings for Veterinary Medicine". US News & World Report. 2015. ^ a b c "U.S. News Best Colleges Rankings: UC-Davis". U.S. News & World Report. Retrieved September 23, 2015. ^ a b Dubgenans, Dennis (2013). University of California, Davis. Charleston: Arcadia. p. 7. ISBN 978-0-7385-9699-0. ^ "Brief University History". UC Davis Special Collections website. Archived from the original on 20 November 2013. Retrieved 15 November 2013. ^ Pringle, Paul; Quinones, Sam (November 20, 2011). "UC Davis chief launches probe into pepper-spraying of Occupy protesters". Los Angeles Times. ^ Gordon, Larry; Sewell, Abby (November 20, 2011). "UC president vows to review police procedures at campuses". Los Angeles Times. ^ "Pepper-spraying policeman departs U.C.-Davis". CNN. 2012-08-01. ^ Stanton, Sam; Lambert, Diana (April 13, 2016). "UC Davis spent thousands to scrub pepper spray references from Internet". Sacramento Bee. Retrieved 13 April 2016. ^ Rawlinson, Kevin (21 April 2016). "Pepper spray university says sorry for search manipulation". BBC News Online. Retrieved 21 April 2016. ^ Chokshi, Niraj, "Embattled University of California, Davis, Chancellor Resigns", The New York Times, August 9, 2016. ^ "ucdavis.edu". Archived from the original on 2017-09-05. Retrieved 2017-09-05. ^ "Backgrounder — UC Davis West Village". Westvillage.ucdavis.edu. Archived from the original on 2011-12-08. Retrieved 2012-03-28. ^ "Arboretum Waterway Maintenance and Enhancement Project". UC Davis Arboretum website. Retrieved 4 October 2017. ^ Levin, Elaine (1988). The History of American Ceramics: From Pipkins and Bean Pots to Contemporary Forms, 1607 to the present. Ny, Ny: Harry N. Abrams. pp. 227–230. ISBN 0-8109-1172-8. ^ "They're egg-cellent!". The California Aggie. Archived from the original on October 15, 2007. Retrieved July 14, 2007. ^ "The Regents". University of California Site. Retrieved February 3, 2011. ^ "UC Davis Administration". UC Davis Site. Retrieved February 3, 2011. ^ "UC Davis Student Affairs". UC Davis Site. Archived from the original on November 15, 2007. Retrieved February 3, 2011. ^ Katehi, Linda (30 September 2014). "Diversity Leads to Success in Higher Education". The Huffington Post. Retrieved 27 January 2015. ^ "UC Davis Facts: By the Numbers". University of California, Davis. September 22, 2015. ^ "UC Davis: Agricultural and Resource Economics". ^ "UC Davis: Majors – Design". ^ "University of California—Davis – U.S. News Best Grad School Rankings". U.S. News & World Report. Retrieved 6 June 2017. ^ "University of California—Davis – U.S. News Best Global University Rankings". U.S. News & World Report. Retrieved 3 November 2018. ^ "2016 National Universities Rankings". Washington Monthly. December 2015. ^ "Money's Best Colleges". Money. Retrieved September 23, 2015. ^ "The Daily Beast's College Rankings 2014". The Daily Beast. November 6, 2014. Archived from the original on June 22, 2015. Retrieved June 14, 2015. ^ "UC Davis Office of Graduate Studies: A Data-Based Assessment of Research-Doctorate Programs in the United States" (PDF). University of California, Davis. 2010. ^ "Economics department ranked number 6 among public U.S. universities and ranked in the top 20 among public and private U.S. universities. — Economics at UCDavis". Econ.dss.ucdavis.edu. Archived from the original on 2014-12-05. Retrieved 2014-08-17. ^ "The Economist Ranks UC Davis MBA in the World's Top Tier – UC Davis Graduate School of Management". Gsm.ucdavis.edu. Retrieved 2014-08-17. ^ "World University Rankings 2016–2017". THE Education Ltd.
^ "QS World University Rankings 2016/17: University of California, Davis". QS Quacquarelli Symonds Ltd. Retrieved September 6, 2016. ^ Andrews, Avital (September 6, 2016). "America's Greenest Universities – The Top 20". Sierra Club. ^ "Newsweek's College Ranking 2011 for UC Davis". Archived from the original on 2012-01-17. Retrieved 2011-12-13. ^ a b "University of California–Davis – Green Report Card 2011". Sustainable Endowments Institute. Retrieved October 11, 2015. ^ Post a Job In print and online today (2012-10-28). "Top Producers of U.S. Fulbright Scholars by Type of Institution, 2012–13 – Global – The Chronicle of Higher Education". Chronicle.com. Retrieved 2014-08-17. ^ CollegeNET. "Social Mobility Index". socialmobilityindex.org. ^ "Common Data Set 2012–2013" (PDF). University of California – Davis. Archived from the original (PDF) on 2018-11-12. Retrieved 2019-01-26. ^ "Common Data Set 2013–2014" (PDF). University of California – Davis. Archived from the original (PDF) on 2017-09-11. Retrieved 2019-01-26. ^ "Common Data Set 2014–2015" (PDF). University of California – Davis. Archived from the original (PDF) on 2017-09-11. Retrieved 2019-01-26. ^ "Common Data Set 2015–2016" (PDF). University of California – Davis. Archived from the original (PDF) on 2017-09-11. Retrieved 2019-01-26. ^ a b c d "Common Data Set 2016–2017" (PDF). University of California, Davis. Archived from the original (PDF) on 2017-09-11. Retrieved 13 May 2017. ^ Lambert, Diana. "UC Davis admits 60 percent of international students but 36 percent of in-state applicants". Sacramento Bee. ^ "Freshman admission profile | UC Admissions". admission.universityofcalifornia.edu. Retrieved 14 September 2018. ^ "Common Data Set 2017-2018" (PDF). Archived from the original (PDF) on 2018-09-26. Retrieved 23 January 2019. ^ "U.S. News Best Colleges Rankings: University of California-Davis". U.S. News & World Report. 2017. Retrieved January 14, 2017. ^ "Features of Volume 24, Number 4". UC Davis Magazine Online. Archived from the original on March 10, 2007. Retrieved July 14, 2007. ^ "UC Davis Grad Studies : Graduate Programs". University of California, Davis. Retrieved 2014-09-08. ^ "UC Davis Student Population Headcount – Fall 2013" (PDF). University of California, Davis. Archived from the original (PDF) on 2014-06-30. Retrieved 2014-09-08. ^ "UC Davis Graduate Studies". ^ "UC Davis Grad Studies : History of Graduate Studies". University of California, Davis. Retrieved 2014-09-08. ^ a b "University of California History Digital Archives". University of California, Berkeley. Retrieved 2014-09-08. ^ "We Started as the University Farm". Retrieved 26 May 2018. ^ "UC Davis Grad Studies : Graduate Groups". University of California, Davis. Retrieved 2014-09-08. ^ "History of Graduate Studies | UC Davis Grad Studies". gradstudies.ucdavis.edu. Retrieved 2016-10-15. ^ "University of California—Davis : Graduate Programs : Graduate Degrees : US News". US News and World Report. Retrieved 2014-09-08. ^ "National survey of Ph.D. programs released :: UC Davis News & Information". University of California, Davis. Retrieved 2014-09-08. ^ Smith-Barrow, Delece. "10 Most Competitive Medical Schools". U.S. News & World Report. Retrieved 5 August 2016. ^ "Rankings by total R&D expenditures". National Science Foundation. Archived from the original on 2018-06-12. Retrieved 2014-08-17. ^ "BGI @ UC Davis Joint Genome Center". ^ "About the Center". UC Davis Center for Poverty Research. Retrieved 27 June 2014. ^ "Welcome!". Humanrights.ucdavis.edu. 2011-11-18. Retrieved 2012-03-28. ^ "Welcome — University of California Center Sacramento". Uccs.ucdavis.edu. Retrieved 2012-03-28. ^ "Analytics :: Nuclear Magnetic Resonance Facility". Analytics.ucdavis.edu. Retrieved 2014-08-17. ^ "Crocker Nuclear Laboratory". Crocker.ucdavis.edu. Retrieved 2012-03-28. ^ Fell, Andy. "Crocker Nuclear Lab at 40". UC Davis. Archived from the original on 2008-10-13. Retrieved 2008-12-02. ^ "About Crocker Nuclear Laboratory". Crocker.ucdavis.edu. Archived from the original on 2011-03-14. Retrieved 2012-03-28. ^ Nicolas Mokhoff, EE Times. "Agilent and UC Davis form millimeter research center." August 3, 2011. Retrieved August 5, 2011. ^ "ASUCD Home Page". Associated Students of UC Davis. Retrieved July 14, 2007. ^ "Jobs ASUCD Information Network". Associated Students of UC Davis. Archived from the original on January 23, 2009. Retrieved March 8, 2009. ^ Wayne Pilcock (April 22, 2012). "98th annual Picnic Day". Davis Enterprise. Retrieved May 7, 2013. ^ "News". KDVS. Retrieved 2012-03-28. ^ "ec.ucdavis.edu". Retrieved 19 September 2014. ^ "Entertainment Council". Ec.ucdavis.edu. Retrieved 2010-06-08. ^ "UC Davis Cycling homepage". UC Davis. ^ "Page Not Found". Retrieved 19 September 2014. ^ "UC Davis newspaper struggles to resume print publication". Retrieved 2016-10-03. ^ "Panhellenic Council". ucdpanhellenic.com. Archived from the original on 2014-03-05. Retrieved 2011-01-08. ^ "Greek Life". Student Programs & Activities Center, UC Davis. Retrieved 2012-09-03. ^ "UC Davis Takes to NCAA Division I Playing Field". UC Davis News & Information. Retrieved July 19, 2007. ^ "UC Davis Timeline: The Road to Division I". UC Davis News & Information. Archived from the original on August 5, 2012. Retrieved July 19, 2007. ^ Rosenhall, Laurel (17 April 2010). "UC Davis cuts 4 of 27 athletic teams – Sacramento Sports – Kings, 49ers, Raiders, High School Sports |". Sacramento Bee/ Sacbee.com. Archived from the original on May 5, 2010. Retrieved 2010-06-08. ^ "UC Davis Spotlight". Archived from the original on October 15, 2007. Retrieved July 14, 2007. ^ "UC Davis Football – Aggie Football General Information". Athletics.ucdavis.edu. Retrieved 2010-06-08. ^ "California Davis Aggies | NCAA Basketball at CBSSports.com". Sportsline.com. 2008-06-11. Retrieved 2010-06-08. ^ "Publication Standards". University Communications. Archived from the original on July 9, 2007. Retrieved July 19, 2007. ^ "Yale's Visual Identity: Yale Blue". Yale University. Retrieved July 19, 2007. ^ "UC Davis: Campus Progress in Green Building Ratings". UC Davis. Retrieved 2016-06-05. ^ "UC Davis: Find Green Buildings". UC Davis. Archived from the original on 2011-05-05. Retrieved 2011-02-28. ^ "UC Davis West Village". UC Davis. Retrieved 2010-09-28. ^ "UC Davis receives 2 best practices awards at sustainability conference". Dateline, UC Davis. Retrieved 2010-09-28. ^ "UC Davis olive oil". Olive Oil Center, UC Davis. Archived from the original on 2007-06-01. Retrieved 2010-09-28. ^ "UC Davis table olives". Campus Grown, UC Davis. Retrieved 2011-01-06. ^ "UC Davis: Water and Landscaping". UC Davis. Retrieved 2010-09-28. ^ "UC Davis: Energy Systems". UC Davis. Retrieved 2010-09-28. ^ a b Daw, Daniel (1 June 2015). "Diamond Developers, U.S. university extend sustainability effort". Gulf News Journal. Retrieved 4 June 2015. ^ Joseph, Suad. "The Sustainable City-Dubai". Department of Anthropology, University of California, Davis. Retrieved 4 June 2015. ^ "Have some SWAG, bring your own BAG". The California Aggie. ^ "Welcome — ASI". Asi.ucdavis.edu. Archived from the original on 2009-10-03. Retrieved 2014-08-17. ^ "GGCS 3 at UC Davis". Ces.ucdavis.edu. Archived from the original on 2014-07-10. Retrieved 2014-08-17. ^ "About UC Davis and our Alumni". UC Davis. Retrieved 30 August 2016. Wikimedia Commons has media related to University of California, Davis.